, an eminent physician, and reader of anatomy to the company of surgeons, was born in Scotland, in 1675. After completing his education he came to London, and applied himself diligently to the study of anatomy and surgery, which he both taught and practised several years with success. Haller, who visited him when he was in England, speaks of him in high terms of approbation. He saw, he says, several of his anatomical preparations made with great art and ingenuity, to shew the motion of the joints, and the internal structure of the bones. He was then meditating an extensive anatomical work, which, however, he did not live to finish, and has rot been since published. 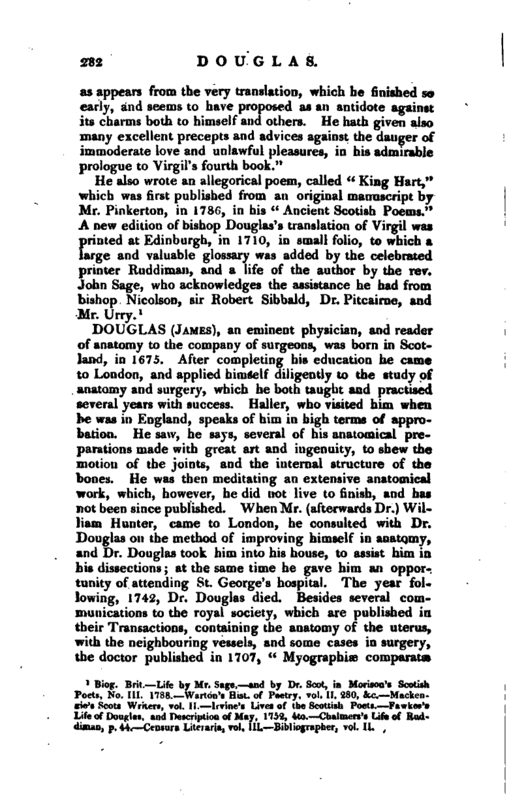 When Mr. (afterwards Dr.) William Hunter, came to London, he consulted with Dr. Douglas on the method of improving himself in anatomy, and Dr. Douglas took him into his house, to assist him in his dissections; at the same time he gave him an opportunity of attending St. George’s hospital. The year following, 1742, Dr. Douglas died. 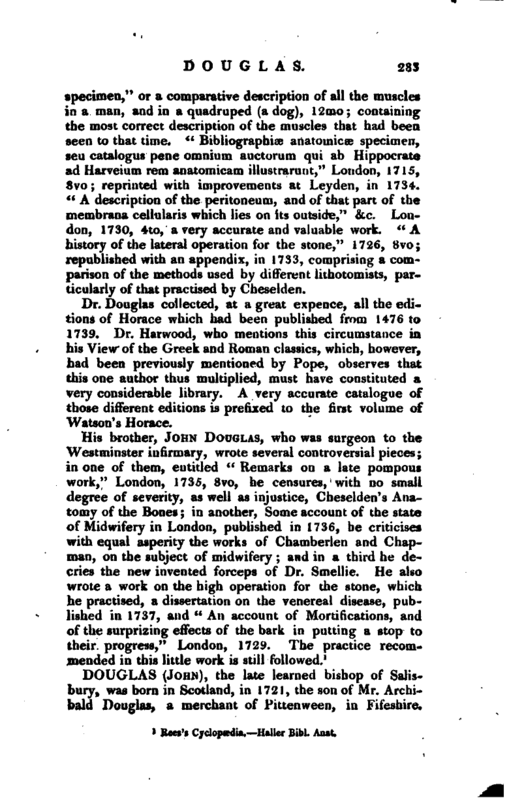 Besides several communications to the royal society, which are published in their Transactions, containing the anatomy of the uterus, with the neighbouring vessels, and some cases in surgery, the doctor published in 1707, “Myographix comparator | specimen,” or a comparative description of all the muscles in a man, and in a quadruped (a dog), 12mo; containing the most correct description of the muscles that had been seen to that time. “Bibliographic anatomicoe specimen, seu catalogus pene omnium auctorum qui ab Hippocrate ad Harveium rem anatomicam illustrarunt,” London, 1715, 8vo reprinted with improvements at Leyderi, in 1731. “A description of the peritoneum, and of that part of the membrana cellularis which lies on its outside,” &c. London, 1730, 4to, a very accurate and valuable work. “A history of the lateral operation for the stone,” 1726, 8vo; republished with an appendix, in 1733, comprising a comparison of the methods used by different lithotomists, particularly of that practised by Cheselden. Dr. Douglas collected, at a great expence, all the editions of Horace which had been published from 1476 to 1739. Dr. Harwood, who mentions this circumstance in his View of the Greek and Roman classics, which, however, had been previously mentioned by Pope, observes that this one author thus multiplied, must have constituted a very considerable library. A very accurate catalogue of those different editions is prefixed to the first volume of Watson’s Horace.